Okra also known as ladiesfinger, vendakkai, bhindi, bendakayi has a lot of medicinal values. It is a good source of dietary fiber, Vitamin C, Folic Acid, essential B vitamins as well as magnesium, manganese and potassium. 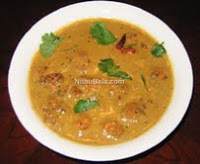 I usually make vendakkai pulikuzhambu/stew using ladiesfinger. This poriyal also features once in a while in my kitchen. It goes well along with some rice and dhal. Wash the ladiesfingers/okra and wipe them dry with a kitchen towel. If they remain wet they turn mushy while cooking. Slice the okra into small pieces . 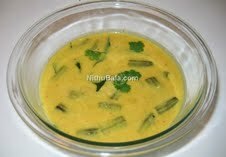 In a vessel, heat the oil and add the mustard seeds and urad dal. 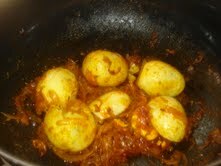 Once they start spluttering, add the curry leaves followed by the onions. Saute till they turn slightly brown. Add the green chillies followed by the ladiesfinger/okra. 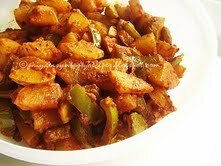 Keep on medium flame and fry till the stickiness of the okra disappears and gets cooked well. Add the salt, turmeric powder and red chilli powder and mix well. Cook for two more minutes on a medium flame and remove from heat. I know, that is a long title!! 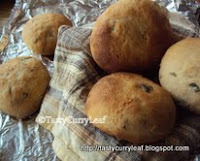 This recipe is adopted from celebrity chef Dhivya's Wholesome Banana Muffins. I adopted the same recipe except that I made it into a bread instead of a muffin by doubling the recipe and I also increased the baking time a little. I also added chocolate chips which I had on hand. 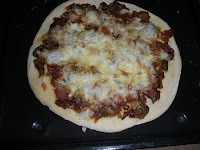 It turned out delicious and I am sure I will be making this again. It has all the goodness of wheat germ and made with whole wheat flour. The pictures do not do justice to the taste of the bread! Mix all the dry ingredients- flour, wheat germ, baking powder and salt together in a bowl. Mash the banana well. In another bowl, add all the wet ingredients together and whisk until well incorporated. Finally add the chocolate chips and chopped walnuts. Slowly add the dry ingredients little by little and mix until everything is incorporated together. Grease a loaf pan and add the batter to the pan and spread out evenly. Bake for about 45 to 50 minutes, until a toothpick/fork inserted comes out clean. Serve warm! it also freezes well. This is amma's version of coriander chutney. 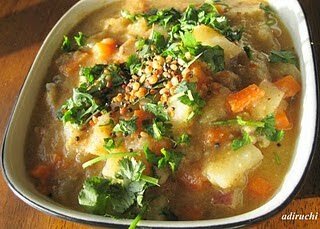 It is slightly different from the normal version because the urad dal is initially roasted along with the coriander to give a nice smoky flavor to the chutney. 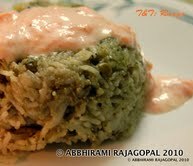 This thuvayal is versatile and goes well with rice, idlies, dosas and even as a spread in sandwiches and burgers. Seperate the leaves from the coriander stem and wash them thoroughly. 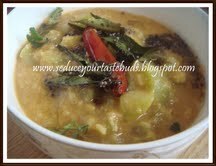 Heat half a spoon of oil in a saucepan and add 1 teaspoon of the urad dhal. 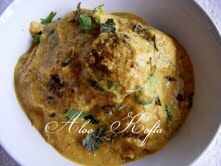 Once it turns golden brown and gives a nice aroma, add the red chillies and chopped coriander leaves. Saute for about five minutes on a medium flame, until the leaves wilt and slightly change color. you should be getting a nice fresh aroma by this time. Switch off the flame and cool this thoroughly and blend using a mixer/food processor along with the garlic clove and tamarind extract. Also add the salt at this point. Meanwhile do the tempering with the remaining oil, mustard seeds, curry leaves, urad dal and pour on top of the blended chutney. Add little water to get the desired consistency. Stays fresh in the refrigerator for atleast 3 to 4 days. 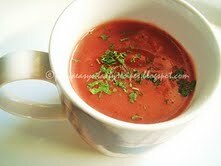 Check out my other chutneys and dips here. This is one amazing, simple and elegant appetizer to prepare especially during spring. I picked up a couple of fresh asparagus spears from the local farmers market. I like the tender, young spears because they are slender and you can use almost the entire stem for roasting without wasting. Any simple seasoning goes a long way. Wash the asparagus spears as they might have some sand particles. Chop the ends or the hard part of the stem. Lay the asparagus on a baking dish as a single layer. Drizzle the olive oil on top and season with salt and pepper. At this point you could use any seasoning you have like garlic salt, italian seasoning, dried herbs etc. Toss the asparagus slightly so that the oil and seasoning evenly coats all the spears. Po it into the oven preheated at 400 degrees F for about 9 to 10 minutes. It must have turned tender and slightly crunchy by now. Squeeze some lemon juice on top and serve warm. It is that simple! Tastes great as an appetizer or a snack! Healthy too! Indo-Chinese cuisine is something I adore all the time! Gobi Manchurian and Vegetable Manchurian is one of my favorite sides along with fried rice. Vegetable manchurian always seemed exotic to me and I have always had a notion that it is difficult to be made at home until I found this recipe! I made this for lunch this weekend along with some quick veggie rice and it made an awesome weekend meal! First do all the grating or mincing of vegetables for the manchurian balls. I used my food processor to do this job. 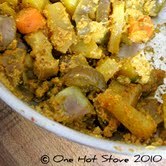 Chop all the vegetables roughly into big pieces and mince to form a coarse mixture. Take care it does not turn into a paste. Also mince the ginger, garlic and green chillies. In a big bowl, take all the minced/grated ingredients along with the flour, chopped green oinions, salt and pepper. Mix thoroughly and form uniform lemon sized balls out of the mixture. Adjust the amount of flour to make the balls as the vegetables tend to leave out water. 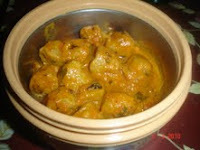 Heat oil in a heavy bottomed vessel, slowly add the vegetable balls into the hot oil and cook on a medium flame until they turn golden brown in color. Drain on paper towels. Do not cook on high flame because the interior of the veggie balls might not get cooked properly. To prepare the manchurian sauce, heat the oil in a saucepan and add the onions followed by the ginger-garlic-green chilli paste. Saute until the onions turn translucent. 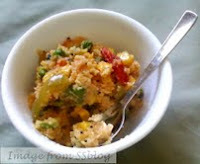 Add the capsicum/bell pepper and cook until it turns soft and yet remains crunchy. Add all the sauces and season with salt and pepper. Add about 1 cup of water and bring it to a boil. Simmer for about 2 minutes. In a bowl, make a paste using the corn flour and a few tablespoons of water. Slowly add this to the cooking mixture and keep stirring on low flame, until the sauce thickens. The sauce is now ready. Garnish with the chopped green onions. Add the manchurian balls to the manchurian balls just before serving. Sending this to Blog Bites -Copy Cat Edition hosted by Nupur. 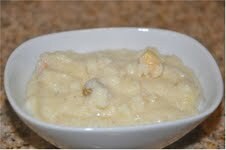 Badam kheer is a rich and elegant drink/dessert which is so easy to make. I have always had the MTR badam drinks, and have never ventured into trying my own version. You could adjust the amount of sweetness as per your taste when you make it yourself. It is a healthy drink as well with all the protein and good fat from the almonds and the calcium from the milk. You could use any type of milk -full-fat,2%fat or fat free. If you are planning to make a rich dessert - evaporated milk would be the optimal choice! Forget the calories!! Soak the almonds in some hot water for about 15 minutes and peel the skin. In a blender/mixer, grind the almonds along with the sugar and milk. Simmer in low heat for about 5 to 10 minutes. Garnish with the saffron threads. This can be served chill on a hot day and hence am sending this to Col-summer challenge and Twenty-20 event. This month Srivalli chose Javvarisi/Sago/Sabudhana Murukku for the Indian cooking challenge. I have never heard of this and the recipe itself sounded delicious. I have never had javvarisi in anything except for payasams. 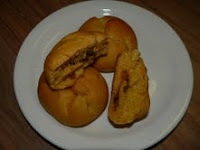 The result was a delicious crispy snack to accompany our evening chai. We liked the murukku and hoping to try it sometime again. 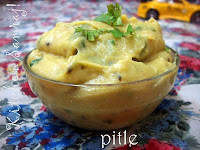 Here comes the recipe as given by Srivalli. In the buttermilk, soak the sago for about two to three hours until it doubles in size and gets translucent. If the sago is not soaked for enough time, it might tend to burst while frying the murukkus. In a bowl, mix all the flours together. Heat about 50 gms oil, mix it along with the flour salt and chilli powder. Slowly add the buttermilk soaked sago and knead to make a smooth dough. In a heavy bottomed vessel, heat oil for deep frying. In the murukku achu, add enough quantity of dough. When the oil gets hot, slowly press the murukku using the achu and deep fry on both sides until it turns golden brown in color. This is a very easy and delicious snack that can be made in a matter of few minutes and tastes great when served with tea/coffee. In a heavy bottomed vessel, heat the oil for deep frying. Use a wired mesh strainer, for deep frying the aval. It is very handy and quick. Just place about 2 tablespoons of aval in the strainer and lower it into the hot oil. It takes about five seconds for the aval to turn crisp. Immediately remove the strainer from the oil and transfer the aval to paper towels. Note: The oil should be very hot while doing this. Otherwise the aval turns soggy and absorbs a lot of oil. If you dont have the strainer, it could be deep fried as usual. But take care the aval does not get burnt. In a little bit of oil, fry the curry leaves and peanuts. In a box, combine add the aval, peanuts, curry leaves, salt, turmeric powder and chilli powder. Put on the box lid and give it a good shake. 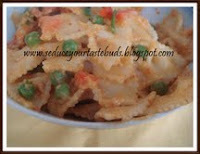 Crispy aval/poha snack is ready to munch on!! Sending this to Magic Bullet giveaway contest hosted at Fun and Food Cafe. After an earthquake weekend, the week started with a downpour of rains here in the usually sunny Southern California. Yeah, earthquake has become part of a season here!! It was a chilly and rainy evening and I wanted to make some hot, hot vadais to accompany our evening chai. I did not want to make the usual kara vadai, aama vadai or uluntha vadai. I remembered that it was long since I actually cooked something from cookbooks. I adapted this recipe from Mallika Badrinath's cookbook and it came out really good. Add the garlic, green chillies and the salt and grind it in a mixer without adding any water to obtain a coarse mixture. Do not grind it into a paste. The coarse consistency actually gives a nice bite to the vadai. 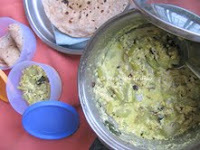 Serve hot with coconut chutney or any chutney of choice. 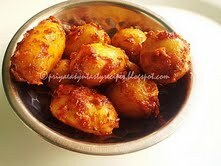 Iserved them all by itself along with some hot, hot masala chai! and Magic Bullet contest giveaway hosted by mansi. 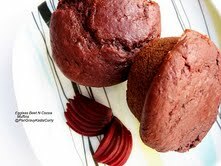 Tried and Tasted the Singing Chef - Roundup! Last month was events galore and Dil Se.. Here is the first roundup for the month. 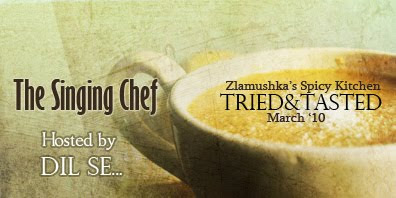 Zlamushka gave me the wonderful opportunity to host the Tried and Tasted March edition. The blogger selected was Raaga of The Singing Chef. 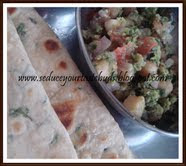 She has a wonderful collection of recipes from all over India and all over the world! Thanks to all the lovely bloggers who tried her recipes and contributed to this event. 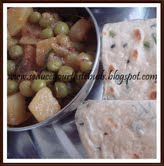 If you havent tried Raaga's recipes, you sure have missed something! Hop onto her blog if you have not!! Without further delay, here comes the roundup!! In any case if I have missed any of your entries, please let me know. i will include it in the roundup.